So it's been no secret that I've been focusing on photogrammetry for a while now. After a long delayed camera upgrade, I've finally finished a new set of photoscanned models for you to download. The difference with the previous models is that all of these have been retopologised, making a lot more suitable to just drop them in a scene. Also, the file size of the download has decreased significantly, even with the 2K textures included. Below is a short promo made with the models, to give you an idea of the quality. And feel free to check out each individual one on Sketchfab. Download them now from the resources page! It's time for another set of trees! As I'm grasping GrowFX more and more, it's nice to experiment a little bit. 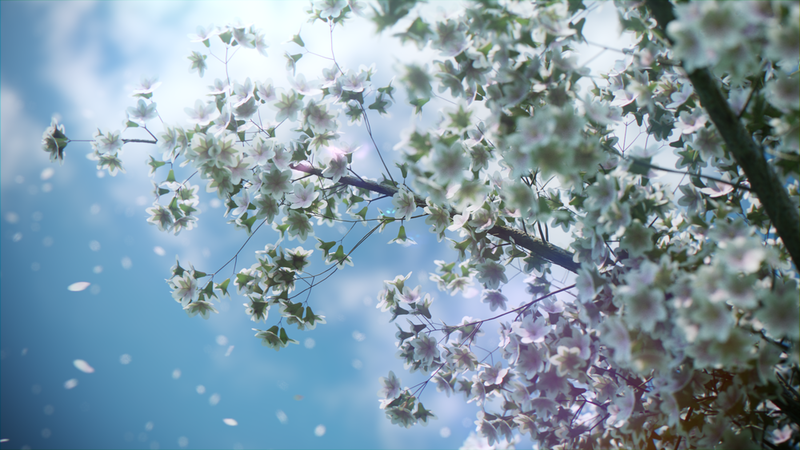 Instead of using basic leaves, I modeled a simple cherry blossom to use as the "leaves". The polycount did increase drastically per tree though, coming in around 10 million polygons per tree. Here's a front view of all five trees, rendered with the included textures. A close-up of the branch structure. I've decided to release the following scripts "as is". I don't work with Vray all that much anymore, as Corona keeps getting me the results that I need. I wanted to release these for people who might be able to use these as a starting point to make more out of them. The pack consists of 4 scripts, one more useful than the other. The two smallest / simplest scripts are VrayCAM and VrayVFB. VrayCAM creates a VrayPhysicalCamera from the current Perpective view, emulating the Ctrl-C shortcut in 3ds Max and VrayVFB is a command to show the Vray Frame Buffer, whithout having to go the your render settings. Then we have VrayMAT, which gives your control over material samples and map blurs scenewide. This can generally be used to reset some settings if you've been messing around shaders. It's goal is to quickly set some key values up in materials / common maps. The last script, VrayOPT, is a little more complicated and may be of some use to quite a few people. It's a script to optimize your Vray render settings based on the great article by Akin Bilgic I featured a while back and the tutorial that followed by John O'Connell showing this process in action. I highly recommend checking these two links out before using the script, as the workflow described in them is the same one the script uses. All these scripts were developed for 3ds Max 2013/2014 and Vray 2.40.04. I don't know if these will get updated, as I don't use Vray all that often anymore, but wanted to share them with you anyway.